I use the module Display News with the custom class dn on my home page to display the last articles published. The width of the module adjusted to the size of the screen but only if the screen is wider than 410px. 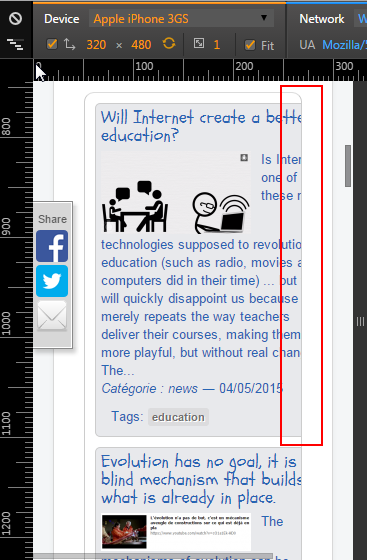 So on smartphone with a screen of 320px, the text in the module is cut. I've found a temporary work around but by setting the width of blogdn width the rule @media. But I have to set 5 different max-width with @media to prevent the text from being cut for all screen width possible between 320px and 410px. Because this isn't a very nice fix I am trying to find something else. I've tried tried several approach, adding position relative to the parent div, or adding display: block; overflow: hidden; but without success. Also there is something strange: on the French version of the website, the module is cut when the screen width is 400px but not on the English version. Couldn't find why. EDIT: This work around seems to work better than the @media one, thanks Lodder! First thing I would do is make the images 100% width and use display:block; for mobiles. Text should not wrap around images on mobiles as long words can push the child element outside of the parent. Id also suggest you use 100% width rather than specific pixels for the blogdn class. You also have a margin and padding being set on the megamod which is pushing the content. Not the answer you're looking for? Browse other questions tagged module custom-module or ask your own question. How to determine (and fix) z-index of an anchor tag within a custom module?